Available as White Airkraft bags, paper outer with a bubble liner and Gold coloured Padded bags made from paper with a macerated paper fibre filling which are recyclable and come in 10 sizes. Jiffy bags seems to be the name given to any kind of mailing envelope with a paper outer and some form of cushioning as a liner. In fact, the original Jiffy Bag was the Padded Envelope introduced by Jiffy in the 50’s and still going strong. This Padded bag has a very strong pure Kraft paper outer and a lining of macerated paper fibres. These fibres actually bulk up in use so the bag’s cushioning properties improve as it travels! 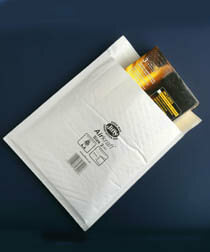 The "Padded Bag" remains the only truly eco-friendly postal bag as it is easily reusable and recyclable. 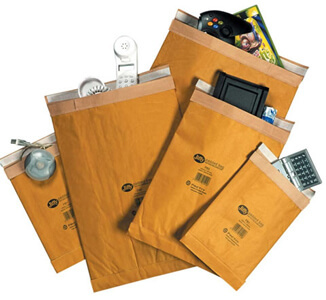 Jiffy Airkraft bags, as well as most of their competitive brands, have a slightly different kind of pure Kraft outer and are lined with small bubblefilm. In the case of Jiffy Airkraft bags the bubble film is laminated to the outer making for a very strong pack. These bags are pretty straightforward, but here are some of the common questions. I am sending single CD’s in jewel cases; should I use padded bags? No, just use a standard Airkraft bag. Unless someone jumps on it your CD will be fine. This would be different if you were sending a number all together. How do I work out if my boxed kit will fit in the bag? Take a soft tape measure and wrap it round your box in both directions. Now, halve these measurements and you have the basic bag dimensions. Now find the nearest Jiffy bag size that will take this size (plus a bit for packing). I want to send slim hardbacked books. Can I use a Jiffy bag? It depends on a) how slim the book is and, b) how hard the cover is - and only you can be the final arbiter of this. Many hardback books will suffer from depression on the corners whilst being otherwise fine in a bubble lined bag such as Airkraft. Very slim volumes (up to about 6 or 7mm) probably won’t suffer appreciably. If you are in doubt we can supply you a sample to try. Can I send large bolts and nuts through the post in an Airkraft bag? I suggest this is unwise; there is a real risk of such heavy items migrating through both the bubble and the paper in transit. Better to use the Jiffy Padded bag and remember, keep them tightly together before they go in the bag. Can I send china mugs in a Jiffy bag? No. Not even in a padded bag. Use a box. Can I get a special size Jiffy bag made? Yes, but again there are substantial minimum order quantities between 25,0000 and 40,000 depending on the size. Partly. The lining of Jiffy Padded bags is made entirely of recycled paper fibres. The outer of the bags is made of pure Kraft paper from sustainable forests. Can Jiffy bags be recycled? The Padded bag is totally recycleable as it is all paper. The Airkraft bags, however, have the bubblefilm laminated to the paper for extra strength, so they are more difficult to recycle in the normal way. Both are easily reusable.